Tyler Watts remembers having a happy childhood: His parents gave him everything he ever wanted, but as a young teenager growing up in Hindman, Kentucky, a small town of around 700 people, nestled in the Appalachian mountains, Watts was also fighting demons. Comments and jokes -- both from strangers and even some members of his own family -- about "gays" and "fags" would jolt right to the pit of his stomach, but at the time, Watts wasn't quite sure why. Looking back, the 37-year-old says he was terrified of admitting who he really was because of those comments he had heard growing up. "I was worried what people would think of me," he says. Watts was born Tammy Watts, but for the last three years he has lived as a transgendered man. And thanks to an oral history project spearheaded by the nonprofit StoryCorps, whose mission is to provide Americans of all backgrounds with the opportunity to preserve the stories of their lives for posterity, and the Kentucky Equality Federation, which is focusing on sexual orientation in rural Kentucky, Watts is about to share his tale of growing up in rural Appalachia in the hope it can help other people like him. The stories are to be preserved at the American Folklife Center at the Library of Congress. "I remember when I first started school and in my mind I related to myself as a little boy," he says. "When I went into first grade I'd get ready to use the bathroom the boys used and the teacher told me 'no no no -- this way'." At first Watts thought he was gay. "Society coerces you into thinking you're something you're not," he says. "My parents were Jehovah's Witnesses at the time and I remember my mom would want me to wear dresses to meetings and I would throw a fit. I felt so uncomfortable in a dress, even as child. I hated it with a passion. In my head I was thinking 'You're dressing me like a girl and I'm not a girl'." Watts began dating a girl in high school and eventually came out to his parents, but said it was when he went through his transition three years ago that the problems started. "My parents learned to deal with thinking I was a lesbian. But when I came out with my transition ... my mother has every right to hurt. She still lives [in Hindman] and works in a small office there and you know how small-office politics are." He says he understands the emotions his mother is going through, but insists it's important for parents of transgendered children to go through a process of acceptance. "You may never understand it, but you can accept it. There's a lot of information out there. And your child is not the only one going through this." Quinton Lewis's experience growing up in rural Kentucky was not dissimilar. Now 17 years old and in his final year of high school, he says he first realized he was gay when he was eight. "I didn't want to tell anybody. I felt alone. But I ended up telling my mom when I was ten and my friends when I turned 12." Lewis remembers the day he broke the news to his mother. It was the night of November 2nd, 2004. "I was laying in bed, watching TV," he says. "I told myself that mom should know; that she will love me no matter what, so I wrote it on a piece of paper and told her to read it. She started crying and told me she'd still love me the same no matter what I am or who I date. I felt a lot better after I told her, but to this day I don't really talk about it with her. "I'm scared to go to school; there are kids that pick on me because I'm gay. I'm scared to use the bathroom because I might get into a fight. These are rednecks and country people. I'm thinking about moving to a bigger city where I'll feel more comfortable living there; probably California or New York. I feel that if I tell other kids my life story, they might understand how I feel. They might be going through the same things I went through and I want to tell them how to get through it, who to talk to, and if they get picked on in school, who to tell and how to avoid it." Josh Griffith is Director of Student Activities at Emory and Henry College, nestled in the highlands of Virginia. He wrote a series of columns for the college newspaper, the Whitetopper, which took the form of letters to the president about LGBT issues in rural Appalachia. Before writing his first column, Griffith asked for help from some students. He got them to play an association game using the words "gay" and "Appalachian." The objective was to throw out words that students felt would reflect the ideas and attitudes of their peers. For "gay," they came up with the following: fag, queer, glitter, homo, immoral, minority, flamer, closet, lesbo, rainbow, AIDS, and metropolitan. "Appalachian," meanwhile, garnered: banjo, redneck, hick, Deliverance, country, hillbilly, conservative, white, slow, bluegrass, and closed-minded. Then, Griffith asked whether the students thought the two pictures they had painted were compatible. "Several people responded quickly -- 'no'." Griffith wrote: "I've talked with so many LGBT people here in our mountains, and their stories are powerful. Experiences of abandonment, exclusion, attempted conversion and worthlessness make up a few of the themes from such stories. Also, self-respect, unexpected acceptance and powerful love complete their pictures. ... It is heartbreakingly inspirational, and yet it isn't wished for anyone." Kentucky Equality Federation President Jordan Palmer says that's exactly why the Storycorps project his organization is collaborating on is so important. "For me it was difficult growing up in rural Kentucky in the early '90s. I was lead singer in a Christian band and went to a Methodist boarding school. I was sent to be 'de-gayed' as if it was a condition. We didn't have gay characters on TV and it wasn't spoken about. I even tried to commit suicide." But, Palmer says, it's certainly not confined to rural communities -- and not all rural communities are closed-minded. "Usually families here are very tight knit; they pull together to make ends meet. I've actually felt more accepted in small communities than in some bigger towns." Palmer hopes the oral history project will make people realize LGBT people are contributing members of society. "We have jobs, we pay our taxes. To me it's no different from being born blind. I was born this way and that's the way God intended me to be. It's about tolerance and acceptance. If they hear these stories -- stories of real people who have faced discrimination, harassment and name-calling, they may think twice about opening their mouths and saying something derogatory or negative." Last week, students at colleges all around the U.S. observed the national Day of Silence to bring attention to anti-LGBT bullying and harassment in schools. One straight student, at Appalachian State University in Boone, North Carolina, had joined others in solidarity, covering their mouths with duct tape as a way of drawing attention to the issue. She wrote: "I have to tell you about how I felt yesterday walking around in silence with duct tape. I felt humiliated at times, and other times proud. You see, everywhere I went, people stared. I felt like a leper, completely stigmatized [by] people. In fact, I was experiencing what the LGBT community has experienced for decades." Story by: Alex Hannaford, a British journalist based in Texas, where he writes about human interest and political issues, religion, crime and culture. You can follow him on Twitter @AlHannaford and read more of his work at his website and blog. 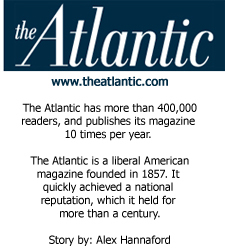 About the Atlantic: The Atlantic has more than 400,000 readers, and publishes its magazine 10 times per year. The Atlantic is a liberal American magazine founded in 1857. It quickly achieved a national reputation, which it held for more than a century. Subscribe to The Atlantic. Here are a few factors which make these types of wrist watches this is the greatest add-ons for those. The actual cost is actually an additional element which makes omega replica uk merely the best option for those. Even though these people appear similar to the unique Rolex however when it comes to omega replica uk they're a lot more inexpensive. For this reason individuals would rather obtain these types of cartier replica uk compared to unique Rolex wrist watches which are very pricey. It is simple to obtain a hublot replica uk without having leading to any kind of stress in your spending budget that is definitely not feasible just in case should you intend to obtain an authentic Rolex. They're extremely fascinating wrist watches. They're omega replica uk in addition to creative wrist watches.